Thousands of people across Scotland are being issued with new debit cards as a way of protecting their bank details following cyber attacks on Ticketmaster. Royal Bank of Scotland (RBS) has written to customers who may have been affected by the online giant’s data breach last year to advise them that replacement cards will be posted out in the near future. Last summer, Ticketmaster admitted that it had suffered an online security breach that affected up to 40,000 UK customers who purchased or attempted to purchase tickets between February and June. A RBS spokeswoman yesterday said the company’s “main priority” was to make sure its customers’ data is secure as she explained the move to replace debit cards. She said: “Following the data breach disclosed by Ticketmaster, we are proactively reissuing cards to all impacted cardholders. 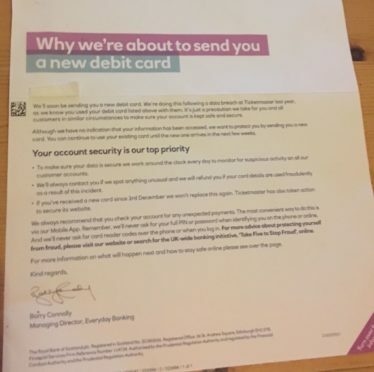 The letter posted through RBS customers’ doors this week is headed “why we are about to send you a new debit card”. Ticketmaster said the hack was caused by malicious software on third-party customer support product Inbenta Technologies. The firm conceded that “some personal or payment information may have been accessed by an unknown third party”. All affected customers were contacted at the time, with Ticketmaster setting up a website to answer any questions they had about the incident. Customers were advised to reset their passwords and offered a free 12-month identity monitoring service. The organisation said the breach was likely to have only affected UK customers who purchased or attempted to purchase tickets. But, as a precaution, it also informed international customers who had purchased or attempted to purchase tickets between September 2017 and June 23. RBS also issued replacement debit cards following a similar cyber hack on British Airways in September, in which 380,000 sets of payment details were stolen.